The flag is green, symbolic of Brazil's lush fields and forests. Its primary feature is a large yellow diamond, symbolic of Brazil's wealth in gold, and in its center floats a blue celestial globe. It includes 27 white five-pointed stars (one for each state and the Federal District) arranged in the same pattern as the night sky over Brazil. The globe displays a white equatorial band with the motto ORDEM E PROGRESSO meaning "Order and Progress". 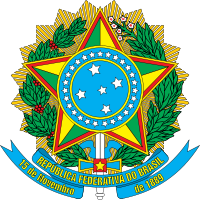 Brazil's coat of arms is fairly straightfoward in its interpretation. The branches, from left to right, are coffee and tobacco; these were two staple crops of the country. The stars in the center make up the constellation the Southern Cross. The twenty-six stars surrounding the Southern Cross represent the 26 districts of Brazil. Some important information is written on the blue banners near the bottom of the coat of arms. The first is the official name of Brazil. The second is the date of the republic's beginning.